Bariatric Waist High Scale, Scale for Obese and Unstable Patients, MedVue Bariatric Scale, Detecto, 6854DHR, 6857DHR. Bariatric Waist High Scale, manufactured by Detecto, is a scale specifically designed for bariatric patients. You may choose this scale if you have patients that are obese or are unsteady. Featuring a low-profile design, this scale is easy for patients to step on and off of the platform. In addition, this scale includes sturdy handrails with padded grips for patient assurance. The Bariatric Waist High Scale uses the MedVue Analyzer Liquid-Crystal Display. This utilizes the "1LOOK" feature, which will calculate and display height, weight, and body mass index simultaneously. 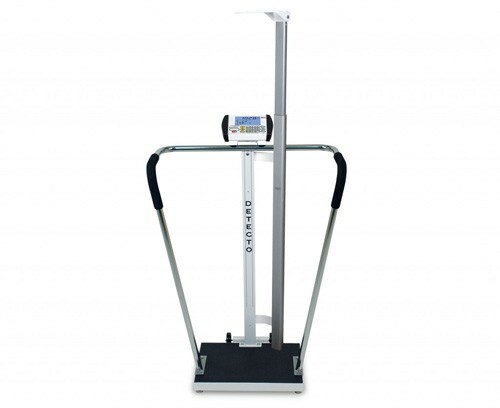 Featuring integral wheels, you can quickly and easily transport this scale throughout a clinic. Truly, the Bariatric Waist High Scale will deliver results that you have come to expect and love from Detecto. Calculates weight, height, and BMI simultaneously. Product Numbers: 6854DHR and 6857DHR. Capacity: 600 and 1,000 lbs. Platform Length: 18 inches / 46 centimeters. Platform Width: 14 inches / 36 centimeters. Platform Length: 24 inches / 61 centimeters. Platform Width: 24 inches / 61 centimeters. Digital Height Rod: 43 to 79 inches / 110 to 200 centimeters. Power: 6 AA alkaline batteries. 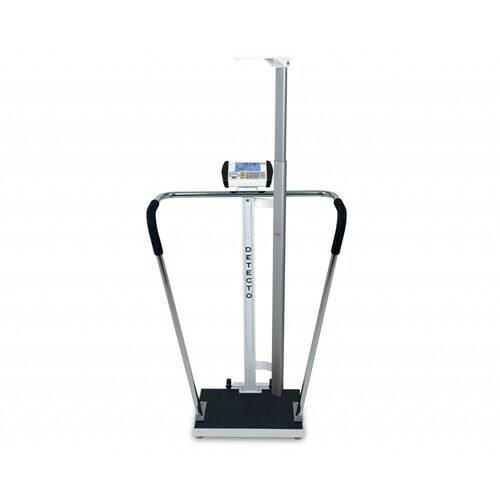 Application: To measure weight, body mass index, and height.